On a purely personal level, 2017 was pretty epic: not least because it was the year in which I got married and became Dutch. Had you asked me ten years ago whether either of these things were on the cards, I might have given becoming Dutch about a 25% chance, while getting married would’ve scored about 2%. 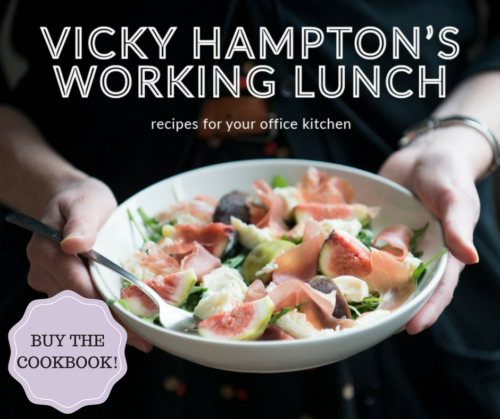 But hey, Brexit causes us all to do crazy things… On a professional level, 2017 also saw me win back the rights to my cookbook and start selling it again. From when I first began writing it back in 2011 through to promoting it today, that book has cost me much sleep, many grey hairs, and unquantifiable amounts of both hours and euros. But it’s my child: no matter how much hard work it is, there are no regrets. 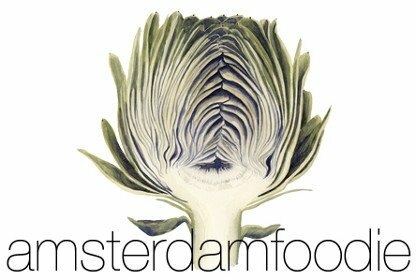 The Amsterdam food scene, meanwhile, has blossomed in ever more unexpected ways over the past 12 months. 2017 was the year in which ramen restaurants started multiplying, and my ramen post got more views in a week than most of my reviews get in a year. It prompted a couple of death threats too, which I can only take as a compliment in this era of Twitter trolls and #metoo. 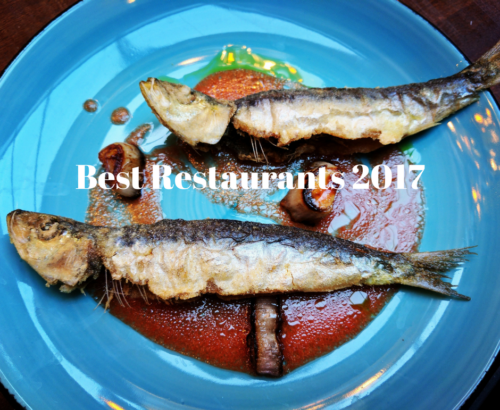 Last January, I went vegetarian for a month, which meant that I discovered far more of Amsterdam’s vegetarian restaurants than I even knew existed before – I’m pleased to report that two of them made it into my 10 best restaurants in Amsterdam list below. Meanwhile, Scandinavian food hit town in the form of Amsterdam’s new wave of Nordic cafes. Plus, a plethora of wine bars serving aperitivo-style bites have also been ushered in. I can honestly say that in my 12 years as an Amsterdammer, the food has never been better. Arguably the future of dining, at Meneer de Wit Heeft Honger the vegetarian dishes are more numerous than the non-vege options and are equally creative. I went there for an anniversary dinner, which turned out to be ideal as the restaurant is very romantic, too. We ordered six dishes to share, which was just about perfect for a hungry couple like us (others might stop at four or five). You can pick your own dishes or let the kitchen decide for you – either way, you’re in for a treat. We tried three of the vegetarian options, each of which was better than the last. The burrata was excellent (I wonder where they get it from?) and came served simply with a couple of lightly roasted cherry tomatoes, fresh basil, a balsamic reduction and crispy flatbread. Parsnip tart was almost like a gratin, with leek tempura and parsnip chips on top. Sweet, rich, and satisfying. Roasted radicchio was my favourite: bitter-sweet, served with cavolo nero, kardoen and the most creamily decadent wet polenta. Pure autumnal comfort and a wonderful use of seasonal veg, with a lovely panko crunch on top. In the meat department, lamb sweetbreads came with caramelised baby onions and a delicate jus. Meanwhile, coquelet (much like a poussin) was marinated in lemon and herbs and served with soaked raisins. All excellent, and perfect for date night – especially when one partner is vegetarian and the other isn’t. Understated and under the radar, Graham’s Kitchen is a culinary enclave down an often overlooked street sandwiched between Van Woustraat and the Amstel River. 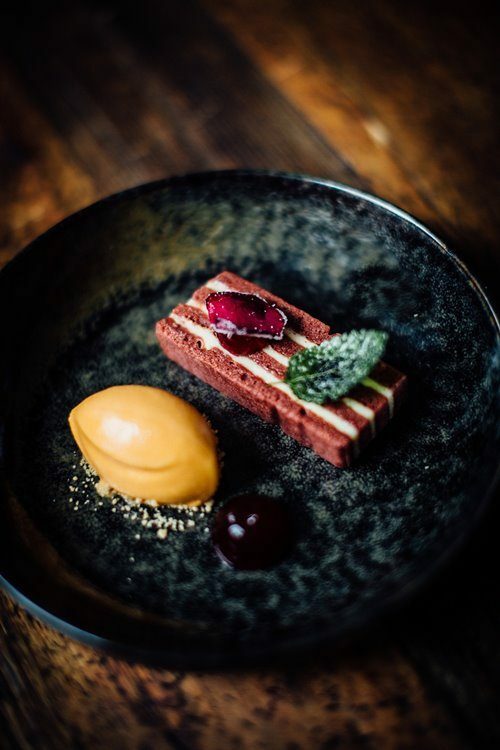 Like many of Amsterdam’s best chefs at the moment, Graham Mee doesn’t offer much choice: you’re invited to order between three and six courses, with the option to take the wine pairings with whichever courses you like. Before the meal proper started, we were treated to a few delightfully unique amuses bouches: the highlight was a creative take on the English breakfast (Chef Graham is from Liverpool) featuring black pudding, egg, bacon and the like in an elegant little potje. But it was the starter that was possibly my favourite dish: avocado with zesty corvina ceviche, earthy quinoa, fiery jalapeno gel, sweet and fragrant pineapple cream, fresh peas, and crunchy corn nuts. It was a zingy delight – a party on my palate. I continued with cod served with a Dutch-Asian fusion of brown shrimps, spring onions, edamame beans, seaweed, sweet slivers of daikon, and an umami-rich miso jus. The meaty main of lamb (both slow-cooked rump and succulent neck) came with a mix of loosely Mediterranean vegetables, aubergine purée, lentils, burrata and basil cream. 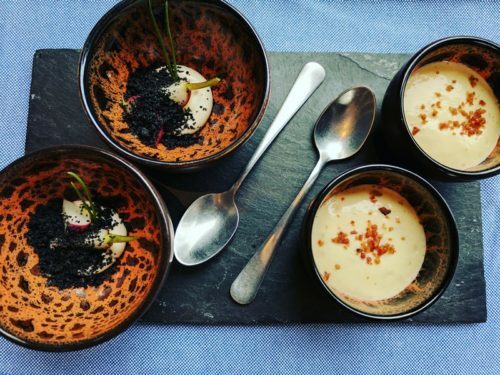 At €38 for three courses, Graham’s Kitchen is definitely competitive with restaurants of a similar level. If you’re looking for a group dining option that doesn’t compromise on quality, Jacobsz in Watergraafsmeer has a huge upstairs dining area for large groups that can house up to 120 people for a walking dinner. The night we went, however, it was just the two of us so you can assume the menu may be a little different at scale. We kicked off with Jacobsz’s signature cocktail: a martini-style drink that featured lemon curd and egg white. Munching on a fancy radish-miso-esque amuse, we perused the menu. I plumped for the pork belly with kale, onion jelly and potato mousse. The flavours were perfectly balanced, and the pork belly divine. My main was skrei, termed as “winter cod” and Norwegian in origin. It was served with mini Thai fishcakes (tasting of shrimp, lemongrass and kaffir lime), a wafer-thin prawn cracker, and a sauce made of similarly Southeast Asian-fusion ingredients. Dessert was a creative take on a red velvet cake, served with carrot ice cream and a slick anemone of rose and hibiscus. Meanwhile, a rhubarb tart was encased in black cardamom pastry and served with black liquorice ice cream. Not everyone’s cup of tea, but heaven if you’re a fan of Dutch drop! There are very few restaurants I’ll bike 7 km to get to in the freezing cold, but Betty’s is one of them. It’s on the Rijnstraat, which isn’t so far out of town if you live in the south, but if you’re coming from my area (Westerpark) it’s a bit of a trek. Once you get there, however, you’ll be greeted by the friendly couple who run the place – the woman is the chef, her other half is front of house. As far as I recall, there’s no menu – you simply let them know if there’s anything you don’t eat and wait to be surprised. The food I ate there was a fusion of many different styles of cuisine, but all vegetarian and mostly vegan too. Think shareable antipasti, spicy dal and rice, pickled root salads, and the most indulgent (non-vegan) desserts. It’s the kind of place where you want to order a bottle of wine, get comfy, and stick around all evening. 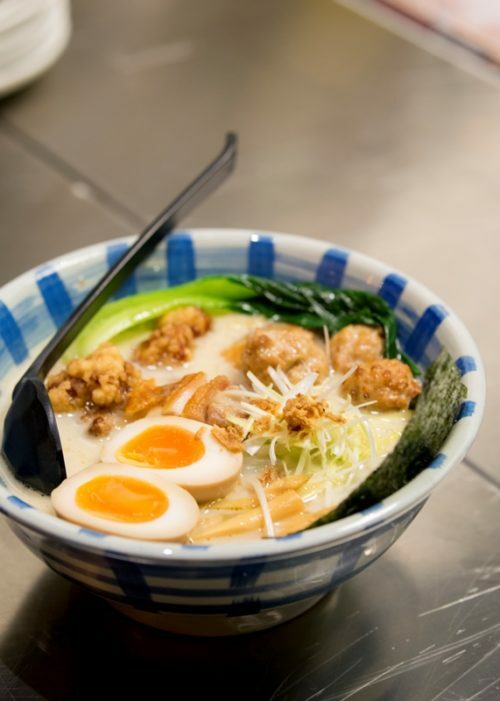 Umaimon Amsterdam is “powered by” Takumi Düsseldorf – where Japanese chef Saeki has been peddling noodles for over a decade. And with good reason: they keep their ramen noodles in a special temperature-controlled cupboard, only getting them out when they’re just about to be cooked. Try the Noukou Tori Soba – a house special that’s as rich as it is fresh, with generous slices of roasted chicken, tiny but tasty chicken meatballs, deep-fried chunks of chicken (imagine a version of KFC that’s Japanese and awesome), sweet bamboo, bok choi and excellently marinated and barely boiled egg. For something less rich, try the Teriyaki Wantan Ramen, which has a much lighter broth but is still generously stuffed with wantan parcels and all the other trimmings. The Butatama Miso Ramen is also a hit – a sweeter, miso-based broth plays host to thin slices of pork and what I assume are lightly caramelised sliced onion. Whatever you order, it’s pure comfort in a bowl. The first thing you notice about Selma’s is the décor’s relaxing pastel hues of pink and turquoise. The coffee is also excellent: a strong flat white with just enough milk and plenty of smooth, fruity flavour. The food menu is as unpronounceable as it is delicious: I ordered a Smörrebröd (open-faced sandwich) of the Skagenröra variety, which was a crawfish and shrimp mayo-based salad served on good toasted sourdough bread. It was fairly creamy, but the addition of lamb’s lettuce and plenty of dill freshened it up nicely. Meanwhile, my friend ordered Köttbullesallad – which I can only translate as meatball salad. 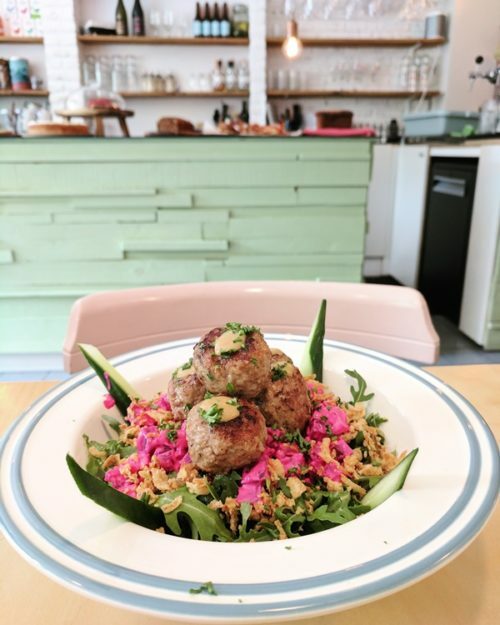 It’s not a combination I’d have ever thought of, but it worked surprisingly well: the salad was rocket based and the beetroot and apple were fresh, sweet and delicious, contrasting in both texture and taste with the soft, comforting meatballs. Because Selma’s is along the Jan van Galenstraat away from the tourist centre, the service is pretty good too – Selma (whoever she is) evidently knows that she needs to keep a local crowd coming back for more. Flying the flag for aperitivo o’clock is Primi, where the friendly Italian guys offer free snacks with your drinks between 5.30 and 7.30 pm every day. 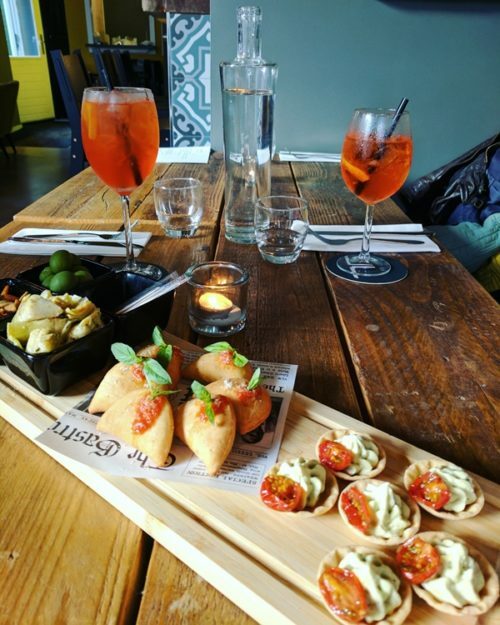 I tried their Aperol Spritz and their Smoky Margarita and tucked into a board laden with olives, nuts, marinated artichokes, creamy little basil tarts and (my favourites) tiny pizza pockets stuffed with oozing mozzarella and a smidge of tomato sauce. Not stopping there, we ordered various antipasti to share: arancini (fried balls of risotto) were tasty. 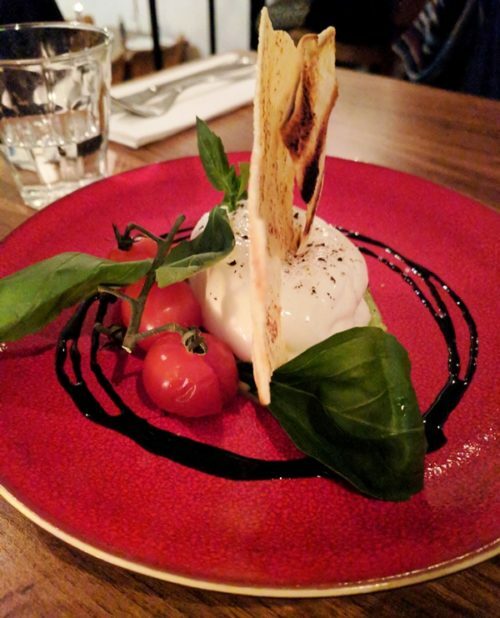 We also tried the excellent burrata, which was served with a sort of cold pea soup, and a dish of aubergine parmigiana – simply triumphant. Primi also serves pasta dishes, gnocchi, main courses and desserts – but after all the aperitivo snacks you’ll probably be far too full to eat them all! Nothing speaks of the moment of cool that fish restaurants in Amsterdam are currently enjoying better than Bar Fisk: part cocktail bar, part pescatarian paradise. If you’re lucky, you might even get to sit at the fish-shaped table. The food is designed to be shared but is larger than tapas-sized portions. Highlights for me were the corvina tartar, which was essentially a cross between ceviche, tabbouleh and smoky aubergine: literally three of my favourite things on one plate. 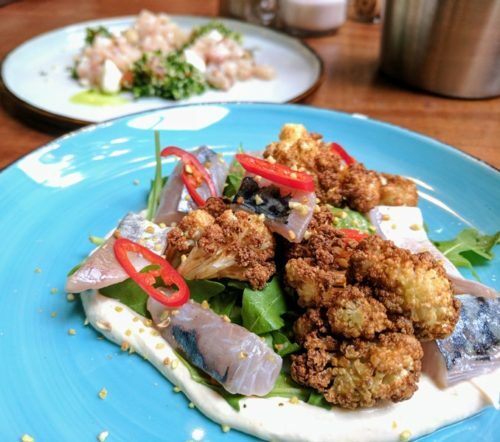 Mackerel (also cured rather than cooked) was served with roasted cauliflower, chilli and a tahini sauce: again, there were so many of my best-loved ingredients here that I couldn’t fail to love the dish. Squid came with earthy beetroot salad and crunchy roasted pecan nuts. Golden fried sardines arrived swimming in a peppery dressing atop a marine blue plate. And pan-fried bream fillets were served simply with some roasted garlic, toasted almonds and yoghurt. 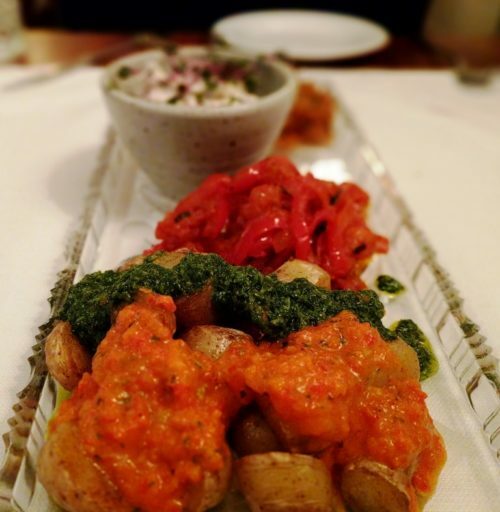 For me, it’s the combination of Middle Eastern flavours and fresh Mediterranean ingredients that really sets Bar Fisk apart. Geisha is special for two reasons: its chef’s menu that allows you to taste a bit of everything; and its cocktails, which are made at next-door sister bar Porem. 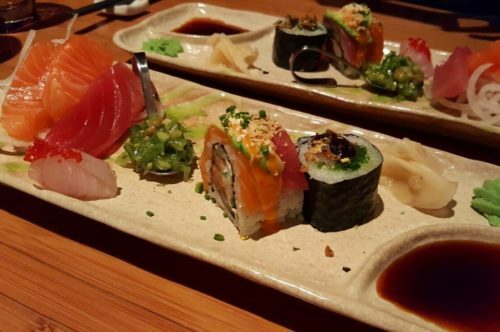 Our starter was a mix of sushi: tuna and salmon sashimi, a rainbow roll and a regular roll. Geisha doesn’t serve a huge range of sushi, so I assume the chef changes up what s/he serves, but you can expect a couple of rolls plus a few pieces of sashimi. Up next was a seafood soup that was slightly spicy, slightly sour and very good. It came with a few mussels, shrimps and veges, but the stand-out part was the broth itself. Our third and final course comprised two dishes: beef tenderloin that had been seared and was served raw and very tender, with an umami-rich sauce that was slightly sweet and slightly citric too. The other dish was seabass, served with its skin crispy and a sticky soy sauce and spring onions. An excellent balance of textures as well as tastes. The service at Geisha is also top notch, making it a great option to take a date or friends from out of town. Saravana Bhavan is a global chain of vegetarian Indian restaurants, although I think there’s only one in Holland. The décor is bright and spartan, which means the ambience isn’t great. But the dosas make up for it. 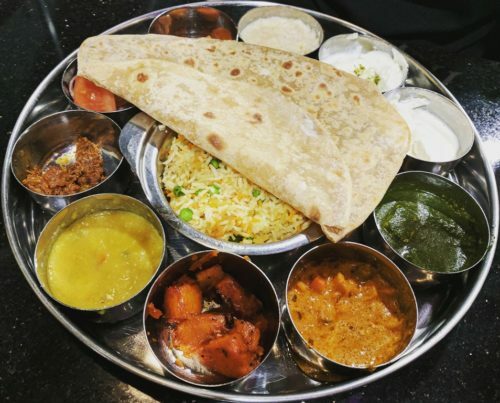 If you’ve never had a dosa before (or even if you have), this is the place to try one: enormous crepe-like discs are filled with everything from cheese to potatoes to lentils. One of those to yourself would probably fill you up till your next meal for just a few euros. But if you do have room left (I suggest sharing), order one of the thalis for a full gamut of Indian flavours. Liked these? 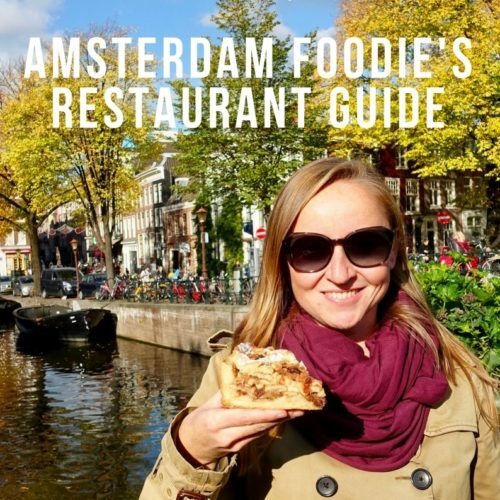 Check out my Amsterdam Restaurant Guide!